Treasures from the Sun King’s glittering court are the pride of museum collections throughout the world. 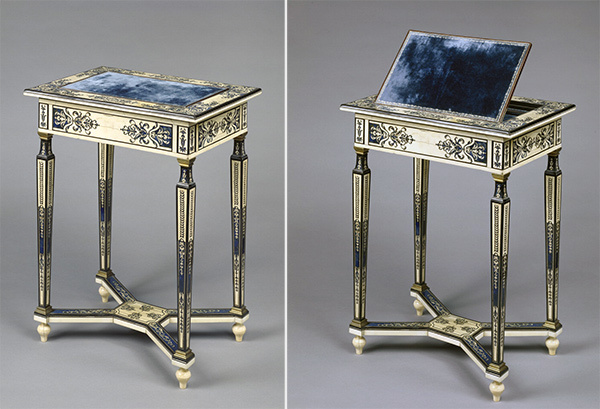 Several of these extraordinary objects, including an exquisite writing table, are featured in an installation in the Getty Center’s South Pavilion (opening June 9) marking the 300th anniversary of Louis XIV’s death. 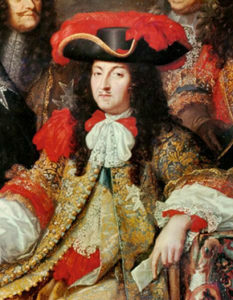 On September 1, 1715, Louis XIV breathed his last before a throng of courtiers, clerics, and physicians in his bedchamber at Versailles. He left behind a rigid system of courtly etiquette that required the king and his family to be on constant display when dressing, eating, and even dying and giving birth. Yet the Sun King occasionally sought refuge from the pressures of court life. 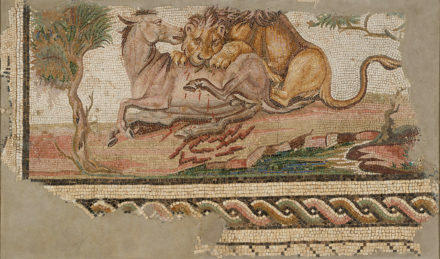 A diminutive table in the Getty Museum’s collection bears witness to the king’s little known private world. 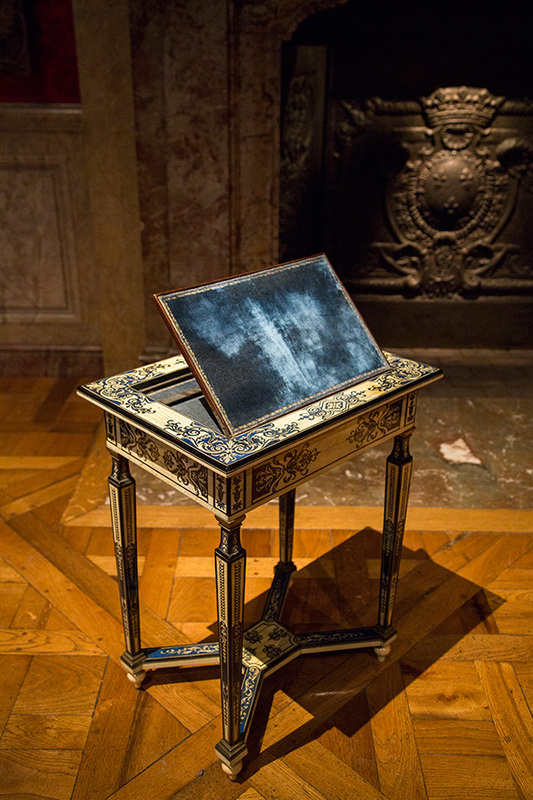 Its small size, only two feet high, suggests personal use; the table also matches the description of one listed in a posthumous inventory of Louis XIV’s possessions. The table was probably made in the 1670s, when Louis XIV was building the Trianon de Porcelaine for his then-mistress, the marquise de Montespan. This small pavilion stood on the grounds of Versailles and allowed the king to escape prying eyes and stifling protocol in the company of Montespan and a few favorites. It was destroyed in 1687 to make way for the Grand Trianon, a pink marble palace that still stands today. The Trianon de Porcelaine was a delicate structure, adorned with blue and white tin-glazed earthenware tiles evocative of Asian porcelain. 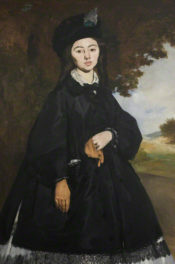 Referred to as lachinage in the seventeenth century, the taste for Asian and Asian-inspired art was shared by other members of the French royal family. 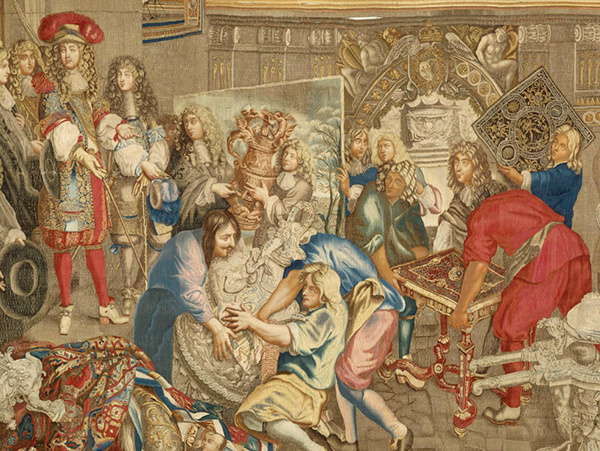 Also owned by the Getty Museum are seven tapestries from a series known as “The Story of the Emperor of China” commissioned by the comte de Toulouse, a legitimized son of Louis XIV and Madame de Montespan. 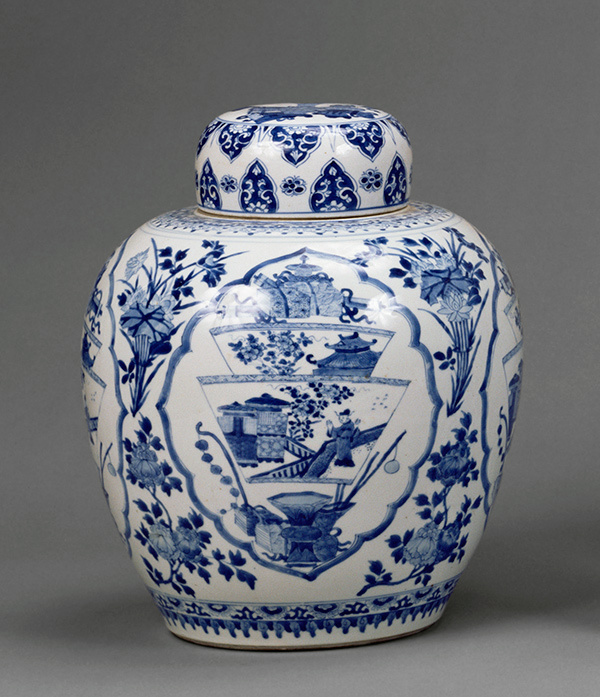 They depict imagined scenes of imperial Chinese court life, including the use of blue and white porcelain. Featuring blue-painted horn veneers in the shape of vegetal motifs and baroque strapwork set on a white ivory ground, the Getty’s ivory table follows this “porcelain” aesthetic. 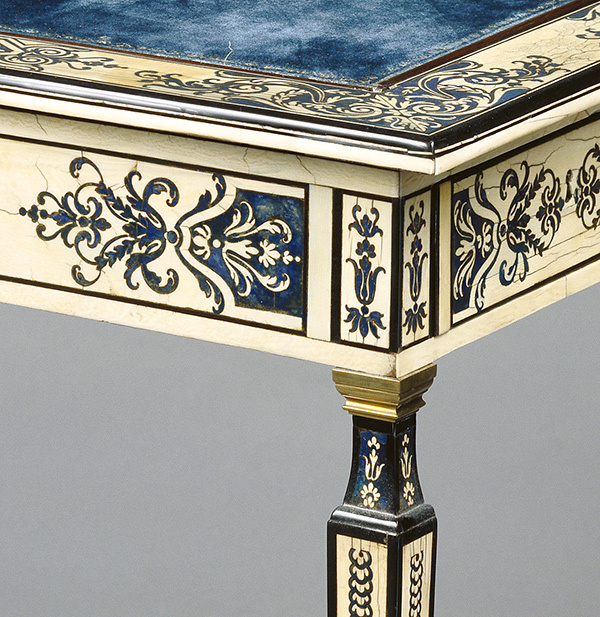 An ebony border frames the table top, and the painted horn imitates lapis lazuli. Although its maker is unknown, a candidate is the Dutch-born Pierre Golle, master ebony furniture maker-in-ordinary to Louis XIV from 1656 until his death. Golle worked at the Gobelins Manufactory in Paris and is known to have made use of ivory veneers. Light and extremely portable, this table is the exact opposite of the heavy, imposing furnishings used to convey royal majesty in the main château at Versailles—some of which was made of solid silver and later melted down to fund the king’s wars. Covered in soft velvet, the table’s top can be raised to form an angled surface perfect for reading and writing, while a side drawer hides compartments for storage. An example of the sort of truly avant-garde furniture made for a king who saw himself and his kingdom as leaders in taste and fashion, this table is an extremely sophisticated piece for its period. Louis XIV’s quest for elegance and refinement in the decorative arts was inherited by his famous great-grandniece, Marie-Antoinette. 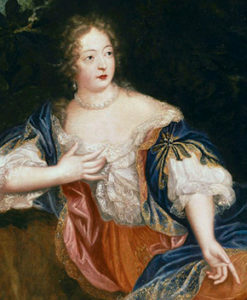 Although disparaged as the “Austrian woman,” she was in fact the great-granddaughter of Louis XIV’s brother, Philippe d’Orléans. Marie-Antoinette also desired privacy and helped to develop artistic tastes at Versailles. Furnishings from her personal estate, the Petit Trianon, and private apartments at Versailles can also be seen at the Getty Museum. Philippe, this is a great article on a magnificent little table! Thanks Garret, the chance to write these is one of the best parts of my work at the Getty! You’ll have to come see the table in-person. The blue and white table is truly one of the most beautiful pieces in the museum. I have a seen a furniture maker in San Diego that built an exact replica of the blue and white table. He even created the contre-partye. He worked with some of the curators at the Getty I believe to get the exact dimensions. I saw them once. They should be featured in the Getty exhibition or at least the all blue table. I am not sure if he even has the tables in his possession. I know he had some art collectors interesting in purchasing one or both of the tables. In fact, Aaron was a student here at the American School of French Marquetry, in San Diego, when I pointed out that the ivory table at the J. Paul Getty Museum was my personal favorite in the entire collection. I tried to tell him that this table was “iconic” (like the Mona Lisa) and that no one in history had made a copy. When he said he would make one, I had my doubts. In fact, when he brought the finished pair of tables here for polishing, I was astounded. In every detail he had produced the finest copy imaginable. They are perfect in every respect. In addition, seeing the “contre partie” example was a real thrill. It would have been a special treat for the exhibition to include these examples as an example of brilliant craftsmanship which is still possible in modern times. I think this is amazing and I’d love to hear a first-hand account of what it takes to create such a masterpiece!